The temple I am writing about is Chiefsun temple (Bodhi temple) close to Tainan city in Taiwan. 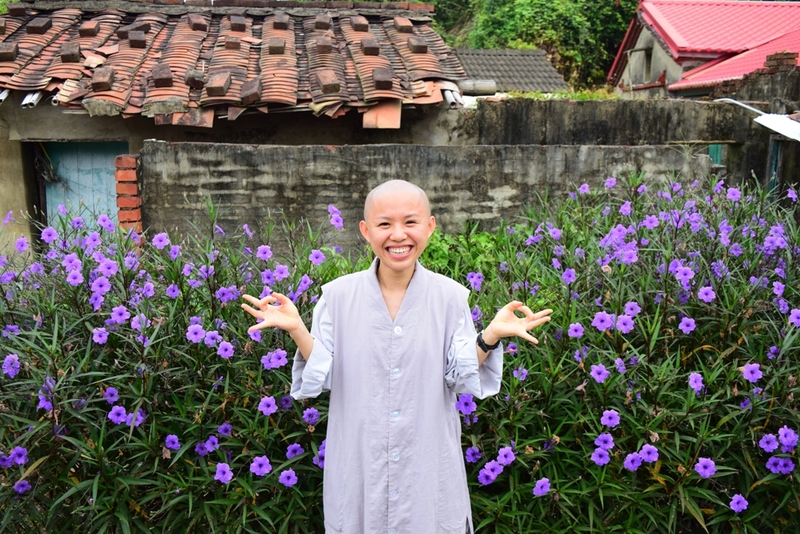 Chiefsun has several branches throughout Asia and currently there are about 90 lovely nuns living at the temple in Taiwan. My friend has sent me lot of information about her routines and made schedules and lesson overviews. Take a look and be impressed! 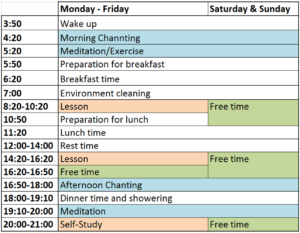 My friend has sent me a weekly timetable to explain life in temple to me. Take a look at the timetable first. Check out the times as well! Looks like a quite tough plan, right? 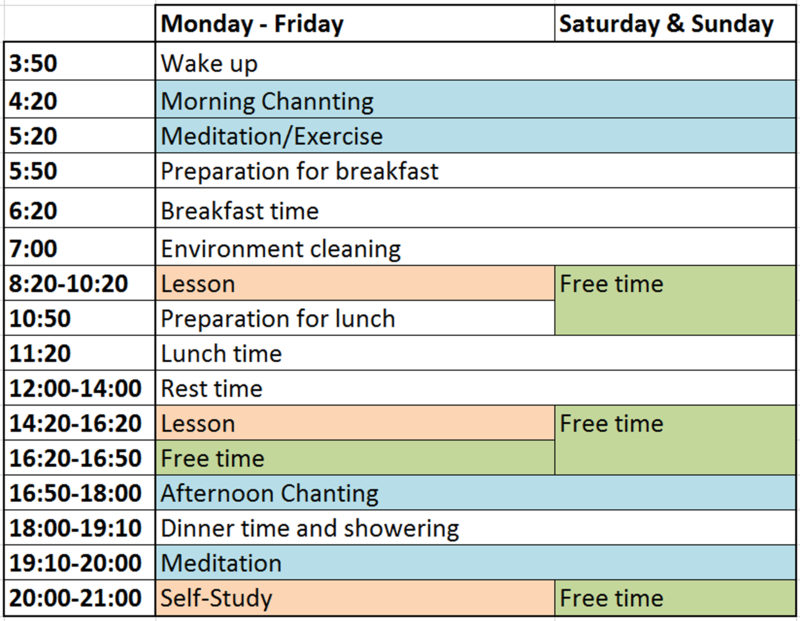 The days consist basically of: strengthening awareness by Sutra chanting and meditating (marked in blue); studying (marked in red); preparing food and caring about the temple. Life in temple is about broadening the mind and studying. It is a rich value that others can learn from. People can come to the temple if they need advice or seek for information on specific topics. The nuns study a lot to pass on the knowledge to everyone who is interested. They also organise temple feasts and are present at feasts outside the temple. Mostly for beneficence and religious ceremonies/festivities. The classes are a mixture of lessons where the nuns learn about broadening their awareness (e.g. 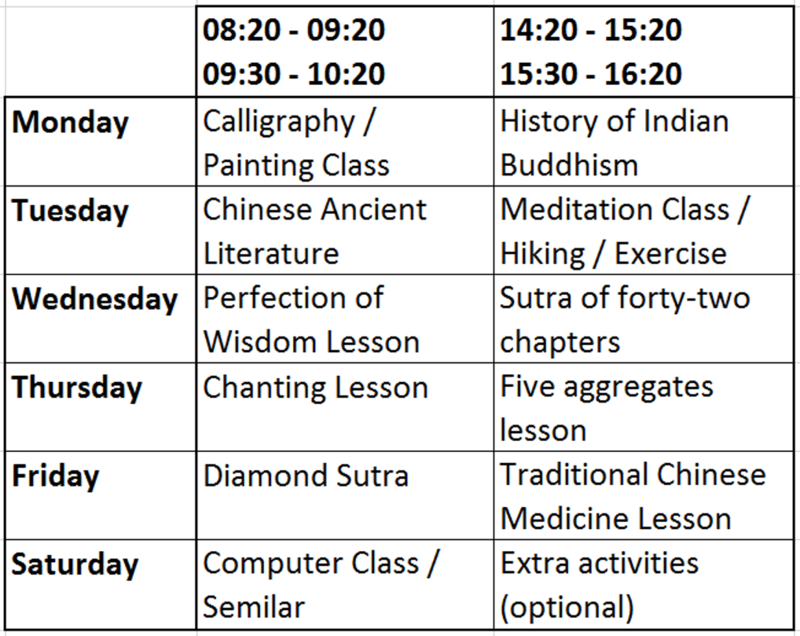 painting class, chanting lesson, meditation class), general knowledge (e.g. 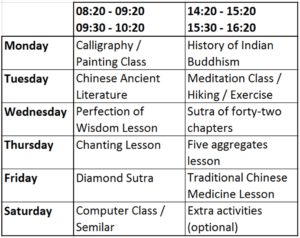 computer class, Chinese ancient literature) and specific knowledge referring to the Buddhism religion (e.g. History of Indian Buddhism, traditional Chinese medicine). The nuns are extremely interested and excited in learning all that. You can see the passion they have for everything that they learn. Most remarkable was the 30 minutes drum playing every morning for wake-up and evening for going to bed. I really miss that drum. It was a constant rhythmic and relaxing sound. There is also a bell ringing for the wake-up and go to sleep ceremony: One ring in the morning before the drums start and one ring in the afternoon to finish the session. The bell symbolizes the beginning and end of the monastic practice and is also a sign for wake-up and going back to sleep. I was told that every nun has to learn the whole morning ritual and will be happy to perform it. My friend filmed the 30 minute morning ritual and just for giving you an impression I have made a one minute short video of it. The drum in the end is played for around 22 minutes all in total. Somehow I like the noise of the drum that woke me up and sent me to bed. 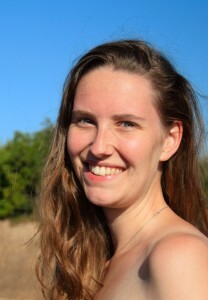 The practice of meditation and Sutra chanting was the most impressive experience for me. I went to meditation and Sutra chanting with my friend once and was excited to be part of the practice. The meditation in the evening is practiced in one of the temple rooms with lights turned off, just some light from the outside came through the windows. I have never done meditation before, which is why it was difficult for me to sit in a room and try meditating with the nuns for about 45 minutes, as I actually didn’t know what I need to focus on. But I wanted to be part of the nuns’ daily life and I could definitely feel the deep concentration of the nuns. The Sutra chanting is something I have never seen before in my life. I thought chanting means they will sing temple songs together or so. But no. What they did is more of a very fast monotone talking of Sutra texts. I do not remember what it is all about but I do remember that all the nuns know the whole 80 pages text book by heart! There was a deep atmosphere of concentration in the room with the sound of the drum and bell in the background, while they were chanting. I had goose bumps just from listening to their concentrated very fast monotone speaking. It felt like they were in kind of a deep meditation by focusing on the text they were speaking. That was a very intense moment and interesting how powerful the mind can be. The stay at the temple taught me that your mind and soul is able to do more than you think. When I experienced the Sutra chanting I noticed the deep concentration of the nuns and that chanting and meditating helps them to broaden their awareness of everything around them. The nuns live a life of simplicity and they love what they do. They have a very tough day but everything they do, they do joyfully. I have learned from them that you should follow your heart and what makes you happy. Whatever you do, you will automatically do it with dedication. I was asking myself, how it is possible to sleep on a wooden bed without a mattress, like the nuns do. The answer is easy: they train their body and brain to get used to it. I must confess that this way of living made me think over my attitude towards life. In our society we learn that one must complete a good education in order to find a well-paid job and to live a wealthy life. But is this what makes you happy? These days at the temple taught me that life is not all about that. I learned that you can live with less and it still makes you happy. It is all about how you grow up and what you learn through your whole life. The temple life gave me a different view of the things. You can teach your body, mind and soul to change your way of living. It is not easy but it is possible. You should only be willing to learn and be open-minded. Then you will achieve a lot more than you think. You can always change your thinking and move to another specific path. Think outside the box and be aware of the diverse lifestyles in the world. Put them together and find your own way of living. I am very thankful that I have learned all that from the nuns in the temple. Do you have a question or want to know some more detail about what I wrote? Tell me, I am happy to interview my friend about it!